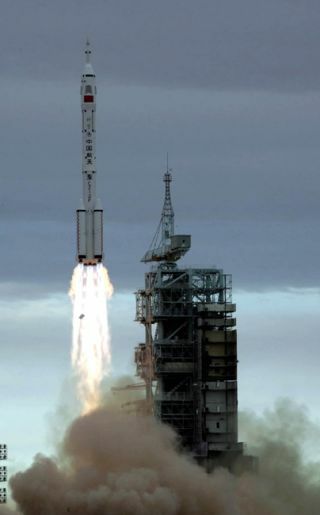 China launched its second manned spacecraft Shenzhou-6 at the Jiuquan Satellite Launch Center in northwest China's Gansu Province at 9:00 a.m. local time Wednesday, Oct. 12, 2005. WASHINGTON- Some congressmen believe the United States and China are in an unacknowledgedspace race that this country could lose if it doesn't spend more money on thecivilian space program. Thecommunist nation's military runs its mannedspace program, employs an estimated 200,000 workers and has set a goal ofputting an astronaut on the moon by 2017. Bycontrast, the National Aeronautics and Space Administration is a civiliangovernment program with a limited budgetthat directly employs fewer than 20,000 civil servants and has lost thecommanding lead it once held over the rest of the world in human spaceexploration. "Wehave a space race going on right now and the American people are totallyunaware of all this," said Rep. Tom DeLay, the Texas Republican whosedistrict includes Johnson Space Center near Houston. The theme,which is not new, emerged again Thursday at a Capitol Hill hearing wherelawmakers were quizzing NASA Administrator Mike Griffin about the Bushadministration's budget request for the space program. This time,though, lawmakers sounded as if they might be willing to do more than just talkabout the issue. Griffin wasasked to produce in 30 days an unclassified report to Congress containing anassessment of the Chinese space program and its goals. Rep. FrankWolf, R-Va., chairman of the House Appropriations subcommittee with NASAoversight, said he would hold a hearing on the subject to coincide with thereport's release. Griffinacknowledged that China's new Shenzou spaceships are capable of supporting acrew on a round-trip mission to the moon. But their LongMarch rockets are not powerful enough to get them there, he said. The UnitedStates has neither a crew vehicle nor a rocket capable of making a moon run. The shuttleis designed for low Earth orbit only. NASA hasbegun work on a lunar Crew Exploration Vehicle, but it won't be operationaluntil 2013 or 2014 because of budget constraints, Griffin said. Its newheavy-lift rocket won't be ready until even later, he said. NASA'stimeline predicts the new rocket and crew vehicle will be ready for a missionto the moon in 2018, a year later than the Chinese target. The U.S.space agency is known for missing planned deadlines for major projects. "Weneed to do more," Rep. Dave Weldon, R-Indialantic, said. Griffinsaid NASA's new lunar vehicles and rockets could be delivered sooner if moremoney is made available, but he added that he's not advocating such a change. DeLayindicated he's willing to push for more money because the stakes are so high. "Wehad a 40-year lead in space and we're giving it up," he said. "TheU.S. is quibbling over $3 billion to $5 billion. It's amazing to me." The Chinaspace-race discussion was touched off by Rep. Mark Kirk, an Illinois Republicanwho in February participated in the first U.S. government delegation visit toChina's remote space launch facility. "TheAmerican people have no idea how massive the China space program is," Kirksaid. Thefirst-of-its-kind, behind-the-scenes tour revealed a modern high-tech facilitythat would be the envy of NASA employees, some of whom still work out ofbuildings more than 40 years old, Rep. Tom Feeney, R-Oviedo, told FLORIDA TODAYin February after participating in the China tour. Published under license from FLORIDA TODAY. Copyright ?2006 FLORIDA TODAY. No portion of this material may be reproduced inany way without the written consent of FLORIDATODAY.